Enbridge Northern Gateway officials are loath (to put it mildly) to speak to the media but sometimes they let things slip. 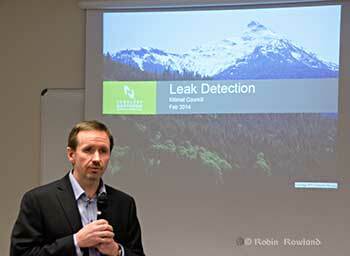 Earlier this summer, at a social event, I heard an Enbridge official (probably inadvertently) reveal that when the company’s engineers came before District of Kitimat Council earlier this year they were surprised and somewhat unprepared to fully answer the detailed technical questions from Councillor Phil Germuth on pipeline leak detection. 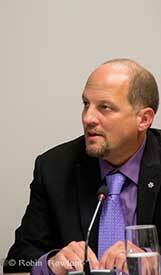 In January, 2015, Phil Germuth will take the centre chair as mayor at the Kitimat Council Chambers. 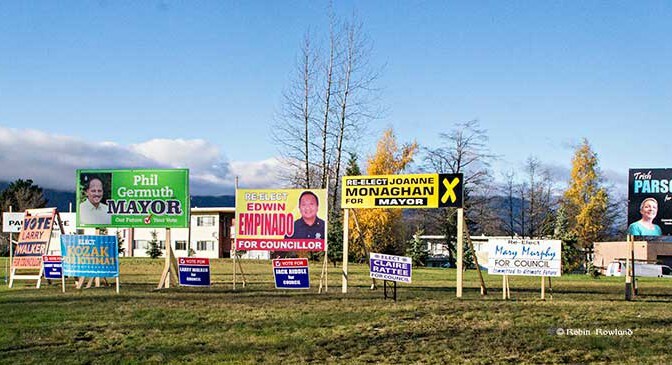 The results of the municipal election in Kitimat, and elsewhere across BC show one clear message; voters do want industrial development in their communities, but not at any price. Communities are no longer prepared to be drive by casualties for giant corporations on their road to shareholder value. The federal Conservatives and the BC provincial Liberals have, up until now, successfully used the “all or nothing thinking” argument. That argument is: You either accept everything a project proponent wants, whether in the mining or energy sectors, or you are against all development. Psychologists will tell you that “all or nothing thinking” only leads to personal defeat and depression. In politics, especially in an age of attack ads and polarization, the all or nothing thinking strategy often works. Saturday’s results, however, show that at least at the municipal level, the all or nothing argument is a political loser. Where “all politics is local” the majority of people are aware of the details of the issues and reject black and white thinking. 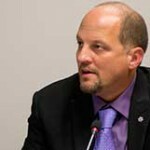 The Enbridge official went on to say that for their company observers, Germuth’s questions were a “what the…..” moment. As in “what the …..” is this small town councillor doing challenging our expertise? But then Enbridge (and the other pipeline companies) have always tended to under estimate the intelligence of people who live along the route of proposed projects whether in British Columbia or elsewhere in North America, preferring to either ignore or demonize opponents and to lump skeptics into the opponent camp. The Northern Gateway Joint Review Panel also lost credibility when it accepted most of Northern Gateway’s arguments at face value while saying “what the ……” do these amateurs living along the pipeline route know? “I am pro-development,” Germuth proclaimed to reporters in Kitimat on Saturday night after his landslide victory in his campaign for mayor. 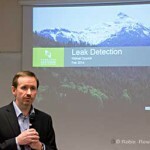 On the issue of leak detection, over a period of two years, Germuth did his homework, checked his facts and looked for the best technology on leak detection for pipelines. That’s a crucial issue here where pipelines cross hundreds of kilometres of wilderness and there just aren’t the people around to notice something is amiss (as the people of Marshall, Michigan wondered at the time of the Line 6B breach back in 2010). Enbridge should have been prepared; Germuth first raised public questions about leak detection at a public forum in August 2012. In February 2014, after another eighteen months of research, he was ready to cross-examine, as much as possible under council rules of procedure. Enbridge fumbled the answers. So that’s the kind of politician that will be mayor of Kitimat for the next four years, technically astute, pro-development but skeptical of corporate promises and determined to protect the environment. Across the province, despite obstacles to opposition set up by the federal and provincial governments, proponents are now in for a tougher time (something that some companies will actually welcome since it raises the standards for development). We see similar results in key votes in British Columbia. In Vancouver, Gregor Roberston, despite some problems with policies in some neighborhoods, won re-election on his green and anti-tankers platform. In Burnaby, Derek Corrigan handily won re-election and has already repeated his determination to stop the twinning of the Kinder Morgan pipeline through his town. In Prince Rupert, Lee Brain defeated incumbent Jack Musselman. Brain, who has on the ground experience working at an oil refinery in India, supports LNG development but has also been vocal in his opposition to Northern Gateway. Kitimat’s mayor and council elections also confirm that Northern Gateway plebiscite vote last April. Kitimat wants industrial development but not at the price of the community and the environment. The unofficial pro-development slate lost. A last minute attempt to smear Germuth on social media was quickly shot down by people from all sides of the Kitimat debate. Smears don’t usually work in small towns where everyone knows everyone. Larry Walker, an environmentalist with a track record in municipal politics as an alderman in Spruce Grove, Alberta, won a seat. Together with Rob Goffinet and Germuth, that is three solid votes for the environment. The other new councillor is Claire Rattee who will be one to watch. Will the rookie be the swing vote as Corinne Scott was? Mario Feldhoff who came to third to Goffinet in the overall vote (Edwin Empinado was second) is a solid councillor with a strong reputation for doing his homework and attention to detail and the unofficial leader of the side more inclined to support development. Feldhoff got votes from all sides in the community. During the debates, Feldhoff repeated his position that he supports David Black’s Kitimat Clean refinery. But as an accountant, Feldhoff will have to realize that Black’s plan, which many commentators say was economically doubtful with oil at $110 a barrel, is impractical with oil at $78 a barrel for Brent Crude and expected to fall farther. Any idea of a refinery bringing jobs to Kitimat will have to be put on hold for now. LNG projects are also dependent on the volatility and uncertainty in the marketplace. The companies involved keep postponing the all important Final Investment Decisions. There are also Kitimat specific issues to deal with. What happens to the airshed, now and in the future? Access to the ocean remains a big issue. RTA’s gift of land on Minette Bay is a step in the right direction, but while estuary land is great for camping, canoeing and nature lovers, it is not a beach. There is still the need for a well-managed marina and boat launch that will be open and available to everyone in the valley. Germuth will have to unite a sometimes contentious council to ensure Kitimat’s future prosperity without giving up the skepticism necessary when corporations sit on a table facing council on a Monday night, trying to sell their latest projects. That all means that Germuth has his job cut out for him over the next four years. Feldhoff is as blind as a bat in my estimation if he actually bought into that bogus David Blacks refinery proposal. That was and is simply a ploy to get approval for the pipeline . The people of Kitimat have spoken as have others along the way , NO PIPELINE. Is Black dumb enough to try and start a refinery without pipeline approval ? I don’t think so . Want a refinery , build it where the goop is mined then move refined product . Is this to hard to comprehend ? Is this Black related to the CON Black of yesteryear ?